High speed collisions between sub-atomic particles inside the Large Hadron Collider atom smasher appear to have unexpectedly created what looks like a new form of matter! Every time we look deeply at the macro- or micro- universe with the idea that it is under constant construction and holds wonders beyond human imagining... we find them. Scientists may have accidentally discovered a new type of "Spooky" matter in which particles seemingly interact at a distance without any direct connection with each other. This new kind of matter is called "Colour-Glass Condensate" and it is a liquid-like wave of "Gluons" which are elementary particles related to the strong force that glues quarks together inside protons and neutrons. The elusive Higgs boson dubbed the "God Particle" was also discovered earlier this year at the same facilities within the European Organisation for Nuclear Research or CERN in Geneva, Switzerland. Scientists didn't expect this kind of "Colour-Glass Condensate" new matter would result from the type of particle collisions going on at the Large Hadron Collider at the time. In the LHC, beams of sub-atomic particles crash into each other at high speeds in collisions, yielding hundreds of new particles, most of which fly off randomly in all directions from the collision point at close to the speed of light. When scientists sped up protons -- one of the building blocks of atoms -- and lead ions and crashed them into each other, the resulting explosions liquefied those particles and gave rise to new particulate matter in their wake. In a sample of two million lead-proton collisions, some pairs of particles flew away from each other with their respective directions correlated! The Compact Muon Solenoid (CMS) team at the LHC realised they were on the cusp of discovering a new phenomenon. Somehow the "Colour-Glass Condensate" or the new matter's particles fly out in the same direction even though it's not clear how they communicate their direction with one another! That has surprised many scientists. 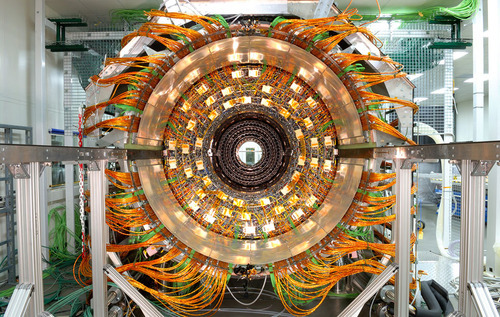 The properties of this new matter may explain some odd behaviour seen inside the LHC machine, which is a giant ring where sub-atomic particles race around underneath Switzerland and France at super speed. The observed particle correlation may depend on a weird quirk of some sub-atomic particles called Quantum Entanglement. Two particles can be entangled so that they retain a connection even after they are separated over large distances, and an action on one reverberates on the other. Quantum Entanglement describes a phenomenon in which particles that were initially connected behave as if they are still interacting with each other even after they have been separated. The phenomenon was so unexpected Albert Einstein famously dubbed it "Spooky Action at a Distance." Quantum Entanglement is at the heart of understanding how significant events across the universe operate at the macro- and micro- level in split-second synchronised unison despite considerable distance between them. Einstein believed that underneath these mathematical probabilities were hidden realities that we just couldn’t see. That was why he, Podolsky and Rosen dreamed up the idea of what we now call "Quantum Entanglement" in 1935. It was to show that either quantum theory was incomplete, because it said there was no hidden information, or it was possible to instantly influence something at a distance. Quantum Entanglement is at the heart of the EPR Paradox developed in 1935. This interconnection leads to non-classical correlations between observable physical properties of remote systems, often referred to as non-local correlations. A similar correlated flight pattern is seen when two heavy particles -- such as lead and lead -- crash into each other. In this case, the collisions create what's called Quark-Gluon Plasma: a superhot soup of particles similar to the state of the universe just after the Big Bang. This soup can sweep particles in the same direction, explaining why their flight directions would be correlated. Since quark-gluon plasma isn't possible with lead-proton collisions, like the ones in the new research, now scientists think a different state of matter, the "Colour-Glass Condensate" may act in a similar way. The "Colour-Glass Condensate's" dense swarm of gluons may also sweep particles off in the same direction according to the Brookhaven National Laboratory physicist -- Dr Raju Venugopalan -- who first predicted the substance, which may also be seen after proton-proton collisions. Entangled gluons in the "Colour-Glass Condensate" could explain how particles flying away from the collision point might share information about their flight direction with each other, Dr Venugopalan said. The intriguing phenomenon of the creation of "Colour-Glass Condensate" was not expected to result from the LHC's run of proton-lead collisions, which was meant to serve as a reference point for comparison to other types of collisions. "You don't expect quark-gluon plasma effects" with lead-proton collisions, Massachusetts Institute of Technology physics Professor Gunther Roland said. "It was supposed to be sort of a reference run -- a run in which you can study background effects and then subtract them from the effects that you see in lead-lead collisions." What Do Space and Time Really Mean? When pairs of particles are generated by the decay of other particles, naturally or through induced collision such as at CERN, the European Organisation for Nuclear Research, these pairs may be "entangled", in that such pairs often necessarily have linked and opposite qualities, ie of spin or charge. The assumption that measurement in effect "creates" the state of the measured quality goes back to the arguments of, among others: Schrödinger and Einstein, Podolsky and Rosen concerning Heisenberg's uncertainty principle and its relation to observation. Quantum Entanglement does underline the fact that quantum particles really do only have a range of probabilities on the values of their properties rather than fixed values. More experiments are now planned and ATCA 5000 is sure the results will be fascinating and spark innovation like the best science usually does! Colour-Glass Condensate displays Quantum Entanglement which lends itself to brand new scientific applications in the world of Quantum Computing, Quantum Cryptography, Quantum Telecommunications, Quantum Energy Devices and Quantum Medical Applications. The new Quantum Technology enabled scientific applications may be orders of magnitude faster and more powerful than existing solutions known to humankind. We are on the cusp of a new age, "The Quantum Age" which lies beyond paradigms of classical physics and "Teleports" us en masse into the near future realms of Simultaneity and what has hitherto been labelled as Science Fiction. Whilst there can be some anxiety, fear and trepidation in regard to the discovery of this brave new world, Einstein also said, "Raffiniert ist der Herrgott, aber boshaft ist Er nicht!" or "The Lord is subtle, but He is not malicious!"